It’s that time of year again! This is Not Art is just around the corner and I’m getting pretty excited. Last year I took I took you through some things to do in Newcastle, but this year I’m getting a little more specific and am taking you to some bookstores. Why bookstores? Because I spend way too much time and money in them. I don’t normally order these lists, but this bookstore is my favourite. It’s nestled behind Blackbird Corner, just off Darby Street, down near the Art Gallery. They have a great poetry section, and their selection of plays hits the mark. I can’t go in there anymore because I never come out empty handed. Cooks Hill is my favourite secondhand store, and Macleans in Hamilton is my favourite new. There’s a cute little area for kids, and I’m fairly certain it’s the only place in town where you can get Australian Book Review. Support your local independent stores! This is the kind of bookstore you go into and you suddenly lose your afternoon, wandering the aisles, picking up everything. Rad literature section. Stroll for a while up Hunter Street and you’ll find it. Don’t be disgusted that I included this store – it’s at the bottom of the Hunter Street Mall, so it’s close to a few of the festival venues. Convenience! That six new books for $50 thing! This is just up from Macleans on Beaumont Street. Two bookstores in one location, and if you have transport it’s only a few minutes from town. Then you should also wander down near the train station and get a coffee from Suspension. There’s coffee in there. Coffee and books. That’s basically all anyone needs in life. Across from the Civic Theatre. Rice’s is right up the end of Hunter Street, even further than Indigo. It’s not all fancy like; it’s just packed with books. And records. Okay, this is getting right out of the TiNA zone (we’re into Mayfield now) but if you’re coming from the north, you’re going to follow the highway right through and drive past this place. There’s a bit of everything here, bro, including rare books and old hardcover crime. Only a few doors up from Books and Pages is where you’ll find this place. Mayfield, it’s like Beaumont Street but…nowhere near as good. A little out again, but coming off the freeway you can take yourself through Broadmeadow and find it. Books and records and sheet music. Also, cheap drinks. What more could you want? Good list! I sort of want to visit these but I also sort of hope I’m too busy to visit them for the sake of my wallet. 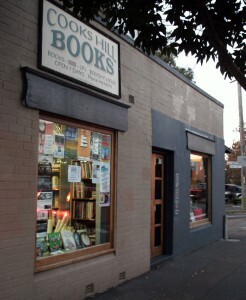 This entry was posted in Books, Opinion and tagged books, bookstore, lip top 10, newcastle, tina. Bookmark the permalink.